I was born lots of years ago, which has given me the opportunity to gain lots of experience of life and art; I studied History of Art at Leicester University, Illustration and Graphic Design at St Martin’s School of Art, Professional Studies in Education at UCE, Heritage Management at Birmingham University, and Archaeological Illustration at Swindon College/Bath University. Somehow, in the middle of all this, I have managed to have a career as an illustrator/cartoonist AND fit in a bit of teaching! I’m one of the few female members of the Professional Cartoonists’ Organisation in the UK, and am also a paid-up member of the Association of Illustrators. 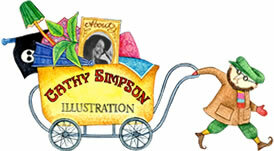 My clients include the BBC, Methuen, Penguin, Blackie, Transworld Publishing, Mitchell Beazley, Scripture Union, Usborne Books, Egmont Publishing, Peter Bedrick Books and many greetings card companies and magazines. I was commissioned to paint two owls as part of a public art project in Birmingham, The Big Hoot. The owls were displayed as a sculpture trail all over Birmingham during the summer of 2015; here I am at the launch party, along with the owl I created for Pertemps, the Midlands-based recruitment agency.